Chloe Cunliffe had one more chance to make history before the transition from her indoor to outdoor track and field season, and the West Seattle (WA) High School senior chose an All-Comers meet on March 17 in Tacoma, Washington, to go after those very real goals. 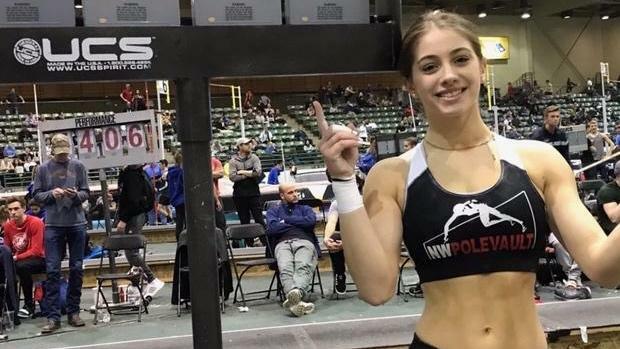 It turned out to be a safe bet, as she claimed a new all-seasons high school national record in the pole vault with a clearance of 14 feet, 9 inches, Track and Field News reported Wednesday. The news outlet added that the mark would have been in line for an American Junior Record, though certain stipulations about officials on site will prevent the mark from being ratified. The mark would currently stand at No. 29 in the world this indoor season. Cunliffe's insane clearance put five inches between the former indoor national record of 14-4 held by Tori Weeks -- last achieved in 2015 -- and it also surpassed the outdoor record of 17-7.5, which Lexi Weeks claimed in 2015. Cunliffe's series moved fast. She saw clearances at 13-1.5, 13-7.25, 14-5.25 and then 14-9 before missing two attempts at 15-1, according to Track and Field News. In total she vaulted nine times, seven of which led to the career best mark. Previous to that outing, Cunliffe tied her career best mark of 14-feet in January at the National Pole Vault Summit and went 13-9.25 at the UW Indoor Preview. A wrist injury prevented the Washington State signee from competing in February, according to the Track and Field News report.